We’re happy to announce that Wonder Tactics begins its pre-registration event for the major update! New Heroes! New Equipment! New Dungeon! Stay tuned to experience all-new Wonder Tactics through the update! 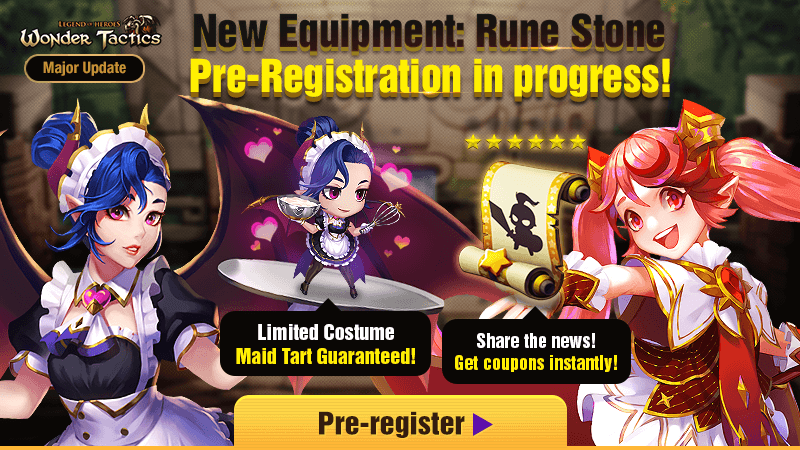 Also, various pre-registration rewards will be waiting for you. So, make sure to sign up for the pre-registration and please share this great news to your friends, too! 4) Various events held before and after the update! 2) “6★ Hero Scroll” instantly given to those who share this event at least once. Thank you always for playing Wonder Tactics and showing love and support for us! We’ll continue to do our best to provide a better service! - Please note the update content is not finalized and is subject to change. - The Friend Invite Event reward will be sent to your e-mail address within a week after the update. - The game download link and reward link will be sent to your e-mail address. - Please install the game and access to the game via the reward link to collect your reward in the Inbox. - Please make sure to open Wonder Tactics at least once and then access to the game via the reward link. - The coupon is valid thru Aug. 31st 7:59am PDT. - Participation is limited to only once per e-mail address. - All event rewards are available once per account. - Please note that participating in this event through unauthorized methods may result in cancellation of your reward. - You can participate in this event regardless of the App market you use (App Store/Google Play). Im excited for the new heroes skills and traits. HYPED!